Barrington is selling "Hate has no home here" signs to residents at cost. Neighboring Haddon Heights has threatened to fine or jail residents who keep the signs up more than 21 days, but has held off on enforcement because of criticism. A simple lawn sign has become a political and psychological Rorschach test for a divided electorate. That’s never been more evident in two adjoining towns in South Jersey. 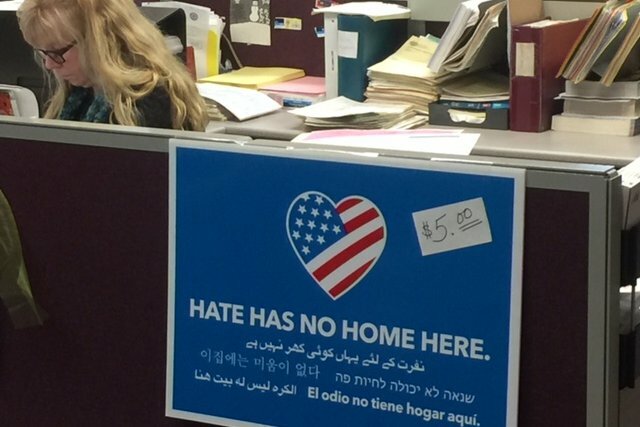 In Barrington, a municipality of about 7,000, the borough ordered 50 "Hate has no home here" signs and sold half of them at cost, just $5, since March 30. In neighboring Haddon Heights, a similar-sized small borough that is more affluent, the same signs were targeted for removal as the town issued an unknown number of zoning violation warnings to some – but not all – residents. The notice cited a 21-day rule on the books, even though “God Bless America” posters and other signs, such as one for a police charity, have been up far longer in the town. Councilman Richard DiRenzo, who supervised zoning before he became a pariah with fellow members of council and was subsequently stripped of that duty, said he believes the notices were selectively sent out. Peppered with criticism, Haddon Heights has put enforcement on hold, meaning no one has yet been hit with penalties which can cost $1,250 or result in a 90-day jail term. The city zoning official who sent out the warnings – with the approval of the mayor – has yet to answer how many notices were issued and why only some property owners got warnings. Councilmembers are braced for questions about the action at a public meeting Tuesday at 7 p.m. in borough hall, 625 Station Ave. The sign itself is simple. Blue – or red – field, with an American flag logo in the shape of a heart.Block lettering reads: HATE HAS NO HOME HERE. Below, in six additional languages, the slogan is repeated. The Chicago neighborhood group which created the sign, says the poster is meant as a way for “neighbors to declare their homes, schools, businesses and places of worship to be safe places where everyone is welcome and valued.” Nothing more. Nothing less, according to the group’s spokeswoman, Carmen Rodriguez. But following an election where the popular vote winner, Hillary Clinton, lost the presidency, and her opponent, Donald Trump, won the Electoral College vote and the presidency, everyone seems to see a different message. Many Trump supporters see the sign as code for an anti-Trump declaration. For instance, in nearby Collingswood, a pro-Trump fan who has been targeted with repeated vandalism, made a take-off sign with the heart-shaped logo reading: "No room for liberal hate here." But in Cherry Hill, the signs are prominently featured in a video the township made preaching tolerance and inclusivity. Clearly, some people are inferring that the meaning of the signs goes beyond its six simple words. That’s just human nature, said Adriano Willey, a mental health therapist who moved from Haddon Heights to Barrington two years ago because her money bought more home and land. On Tuesday afternoon, she was picking up her two children from a recreation center adjoining borough hall. “They’re projecting their own stories and sensitivities and biases. It is a Rorschach” test, Willey said, referring to the psychological test that analyzes subjects' perceptions of inkblots. She admits her own projection about the sign, saying the it reminds her of the decidedly anti-Trump slogan, “Love Trumps Hate.” But she takes pains to point out that she doesn’t take issue with the sentiment: "Hate has no home here." Inside Barrington town hall, clerk Terry Shannon and her staff are selling the placards at cost, following up on a request by a local resident. Borough leaders consider the signs neither political nor commercial, so they are allowed by the borough's zoning regulations as long as they aren’t placed in the curb right-of-way, Shannon explained. Shannon said the current “political climate” has led many people to interpret things emotionally. “But it is difficult to understand how people can be against signs that are against hate. It’s concerning. It seems we are going backwards,” she said. Just two blocks from the border with Barrington sits Colleen Cerritelli’s home in Haddon Heights. On the front lawn, the familiar blue poster is plainly visible, but she did not get a warning letter last week from zoning official Ron Newell. Just a couple of blocks in either direction, however, Newell's citation arrived at two homes whose owners have clear political affiliations. Ironically, Cerritelli distributed 700 of the "Hate has no home here" signs in the area, even as some residents and officials allege the borough is engaging in questionable selective enforcement of the signage law. A transplant from Portland, Oregon, the young mother had researched South Jersey before buying in Haddon Heights because she saw it as a “family friendly” place. And she still does, with a caveat. If she can juggle her kids’ schedules, she'd like to deliver that message unambiguously to borough officials on Tuesday night.